Mini Me is an artist. She attacks every new project with a vigor I sometimes wish she’d use for cleaning her room. Her artistic endeavors can last for a few hours, or they can drag on for days. While she is in the midst of these spells, homework, chores and occasionally dinner, fall by the wayside. Her latest obsession is jewelry making. Sparkle and shine are close to my eight-year-old’s heart. So when I came with a bag full of colorful beads, I was prepared for her to be lost for a few days. One weekend afternoon, we each made three bracelets. Then I left Mini Me to her own devices. Over the next week, she made 10 more. I doubt she’s done. In addition to being prolific, my eight year old is also proud. She has no problem wearing her entire collection at once and explaining the placement of each and every bead. I’ve had to remind her on several school mornings that “less is more.” I said this, of course, as I piled on my own array of arm candy. What I was not prepared for was the note I received from Mini Me’s teacher, Mrs. J.
I couldn’t help but laugh. That night, I had to put the chuckles aside and talk with Mini Me about the note. “Why are you playing with your bracelets in class?” I pointed to the pile of rainbow and sparkle on the kitchen table. “They’re so pretty, and you can wear them in different patterns.” She picked up a few and started to demonstrate her point. I thought back to a conference call I took earlier that day. 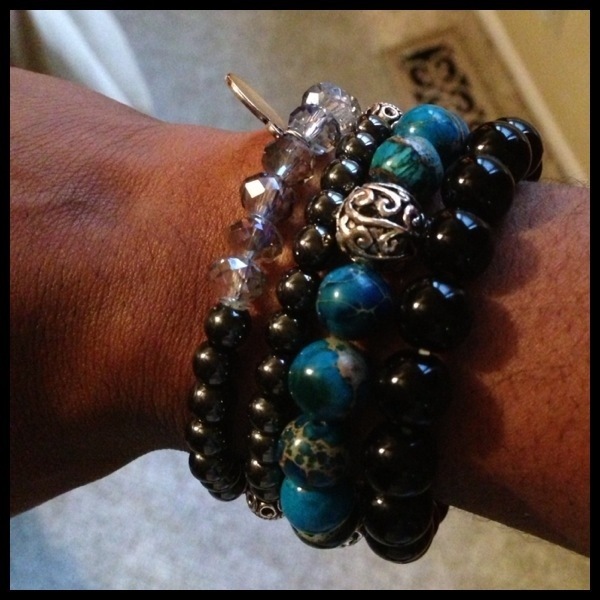 While a group disagreed about a deadline, I twirled blue beads around my wrist. Perhaps maintaing focus was something we could both improve. I explained that while fashion and jewelry are fun, there is a time and and place for it. That place is not the middle of class or on a conference call. Mini Me nodded, but I don’t think she was convinced. For now, though, we’ll reserve arm candy for the weekend. Yes it could be much worse, so I’m not complaining (too much). Thanks for stopping by! 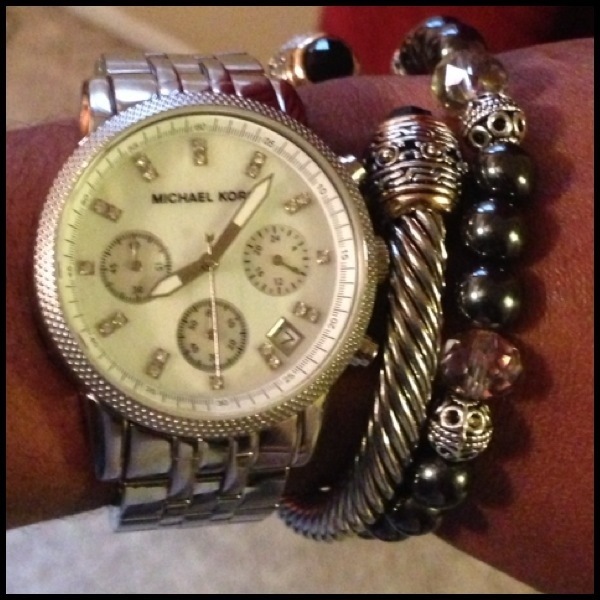 Lovely arm candy! I especially love the second one!